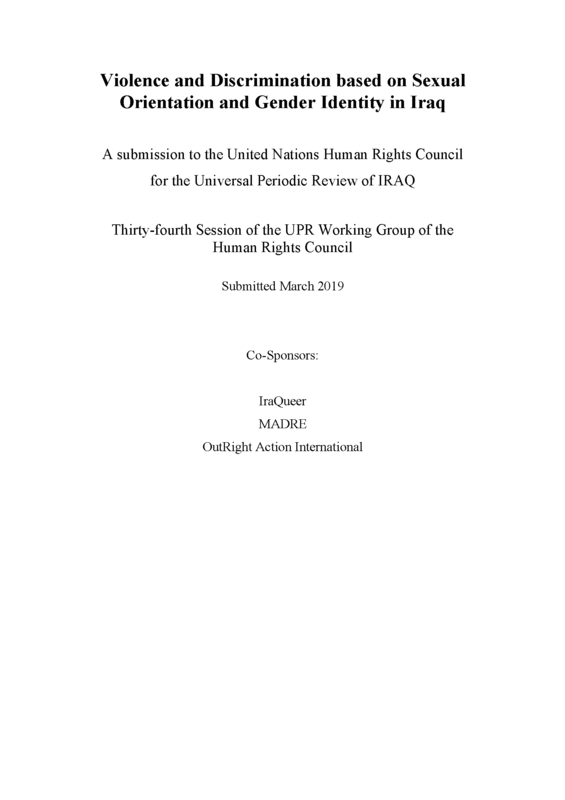 This report is submitted by IraQueer , MADRE, and OutRight Action International. It addresses urgent areas of concern related to the status of human rights of lesbian, gay, bisexual, and transgender (LGBT) people in Iraq. Violence and discrimination against LGBT individuals in Iraq continues to flourish, and victims are guaranteed virtually no protection or redress. The Government has failed in its obligations to promote and protect the human rights of those who face violence and discrimination based on their sexual orientation and gender identity. Faced with the ever-present possibility of discrimination, extreme violence, torture, and murder, being perceived as LGBT in Iraq places one in immediate danger. The state-sanctioned culture of anti-LGBT discrimination permeates Iraq’s institutions and society. Perpetrators of egregious anti-LGBT human rights violations include victims’ family members, militia fighters and religious militants from various groups, as well as government officials. Members of the security forces and police are, at best, non-responsive to human rights violations committed on the basis of sexual orientation or gender identity, and at worst, active participants in them. People in Iraq can count on virtually no protection or recourse for anti-LGBT violence and discrimination.